Reiki is a natural, non-invasive method of hands-on healing. The traditional Reiki story begins in the mid-1800s with its founder Mikao Usui in Kyoto, Japan. There are many different versions of Mikao Usui’s life history combined with the introduction and spreading of the practice of Reiki in Japan and in the West. The following account is based on the teaching of the lineage I have been attuned to, and while all stories will vary and you may question their authenticity, Reiki has a power of its own and transcends teaching methods as well as Teachers/Masters. Mikao Usui was principal at a Kyoto university and, as such, he was very curious about finding out how Jesus healed people who came to him. He started a ten-year search to find out the answer first through Buddhist teachings, then through theology studies in the United States, where he lived for seven years and where he learned to read Sanskrit. When he returned to Japan he studied Sanskrit texts describing the healing formula, but was still unable to see how to activate it, so he decided to pass a test. The test consisted of a three-week period of meditation, fasting and prayer on Mount Koriyama in Japan. On the final morning of his quest, he finally had the vision he needed and saw how to activate this ancient healing method. It was the first Reiki attunement, the rediscovery of an ancient method of healing. He started healing beggars living in Kyoto’s slums, but he realised they kept on coming back for more healing. Therefore, he realised that, for Reiki to work (as energy), an exchange needed to occur, be it money or service. He started touring Japan, taking Reiki on foot through Japan. He met Chujiro Hayashi, a retired naval officer who he trained to be one of his students and through which Reiki expanded in the West. Mikao Usui then died in 1926. Hayashi and his wife opened a Reiki clinic in Japan, where Hawaiian-born Hawayo Takata came for healing. Not only was Hawayo healed completely at all levels, but she took all the attunements needed to become a Master, and was Hayashi's disciple chosen to introduce Reiki into the United States, then Europe. Takata died at 80 years of age and she was the means by which Reiki continued and expanded in the West. 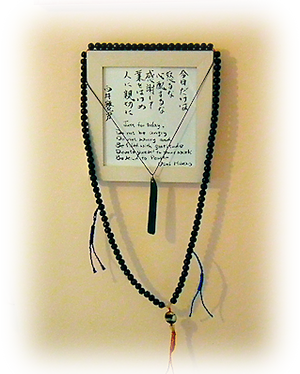 There are different schools of Reiki in the West, as well as in Japan. I have personally been trained and taught through the traditional Usui Shiki Ryoho as taught in the West descending from Hawayo Takata lineage. This traditional Reiki enables the transfer of Reiki healing energy from teacher to student, and relies on attunements for each of the levels taught. In the 1980s, Dr Robert Becker, Dr John Zimmerman and Max Cade found that when people perform hands-on healing therapies not only do the brain wave patterns of practitioner and client become synchronised in the alpha state, but they pulse in unison with the earth’s magnetic field, known as the Schumann Resonance. Zimmerman’s studies show that the brain waves patterns of practitioner and receiver are not only synchronised in the alpha or theta state, but become left-right balanced - both indicators of deep relaxation and meditation. The experience of inducing meditative state is typical of Reiki, and the effects of regular meditation on health have been extensively studied, the most important contribution to health being in primary prevention. Fewer visits to the doctor, shorter hospital stays, lower admission rates to hospital for medical and surgical conditions were shown in the meditators’ group compared to a control group. During a Reiki session both practitioner and client receive the benefits of the channelling of energy, which makes it very efficient. This research was carried out on a wide array of cross-cultural subjects, and, no matter what their belief system was, they all tested the same. This neutrality makes it appropriate to a medical setting. It is also worth mentioning that those who receive Reiki regularly seem to find it easier to meditate than before. According to various studies, Reiki seems to reduce pain following different types of surgery, as well as in the opioid therapy management of pain in palliative care. The Healing benefits includes deep relaxation and a sense of inner peace, allowing the body natural and innate healing abilities to ease aches, pains and ‘dis-eases’, while reducing stress and anxiety levels by balancing the client’s body into its natural state of harmony. Its ultimate purpose is to awaken the healing ability within.